This will take several weeks and until then this index will not be comprehensive. The work at street level around each station is crucial. People will quickly get used to the new arrangements of steps and paved areas and new road alignments and, inevitably, find it difficult to remember what each area looked like before …. particularly as the disruption of major engineering work has meant temporary arrangements and high hoardings around many parts of the city for many years. The precise arrangement of steps and lifts and the crucial bike stands will be important not just for how each station deals with the numbers of passengers each day - estimates suggest that 18,000 passengers a day will use Gammel Strand - but the planning will determine the way people use the area immediately around each station. Here at Gammel Strand, many using the Metro will be heading to or coming from the parliament buildings at Christiansborg on the other side of the canal so the steps up and down from the east end of the platform are double width. 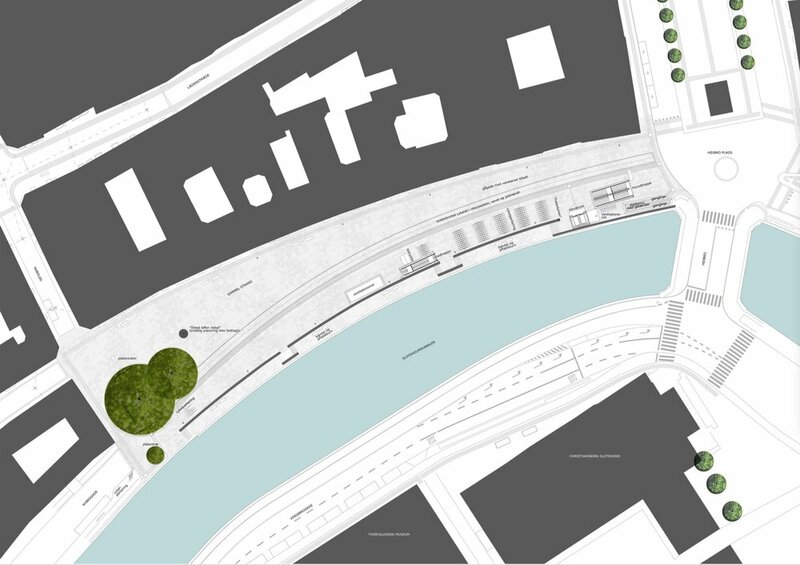 It seems that, in part to respect the historic quay side, and reduce the impact of the new station superstructure, Gammel Strand will not have skylights found on most of the existing stations to throw light down, between the escalators, to bring as much natural light to the platform as possible. Gammel Strand was a commercial quay backed by warehouses and merchants’ houses but for many years it was also the fish market until it was moved out south down the harbour to Fisketorvet.